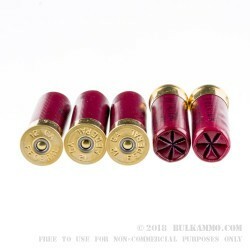 While devastatingly effective in close quarters battle (CQB) scenarios, most shotshells begin to rapidly lose their effectiveness at extended ranges out to 20 yards and beyond. 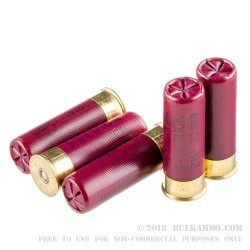 The Federal 12ga Law Enforcement 2-¾ 00 Buck seeks to redefine conventional shotgun limits, and provide law enforcement officers a definitive edge in hostile situations. 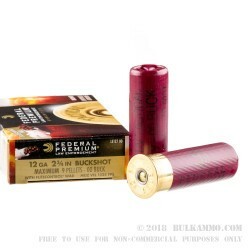 Utilizing Federal’s patented Flight Control technology, the Federal 12ga LE 2-¾ 00 Buck is able to achieve tighter, denser shot patterns than traditional shotshells. Unlike traditional wads that immediately begin to break away from the shot after exiting the barrel, Flight Controlled wads keep the shot cloud embedded within the wad for the first 10 yards, before gradually backing away and releasing the shot. This creates a denser, more accurate shot pattern that can effectively engage targets at ranges well beyond traditional limits. Brass heads provide a malleable surface that will not prematurely where your extractor during heavy courses of fire, and precision measured propellants guarantee a consistent and reliable performance regardless of lot or date of manufacture. 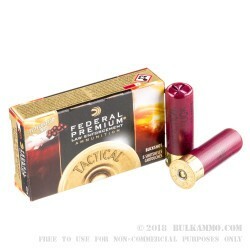 For law enforcement officers looking to effectively extended their reach without sacrificing performance or accuracy, the Federal 12ga Law Enforcement 2-¾ 00 Buck is one of the most effective buckshots on the market to date.